For those future brides that want more than what the average makeup artist in Atlanta, GA can provide, Tynisha is the best option in the city. She has an impressive list of previous clients and a range of reviews that are filled with praise for the finished results and the entire experience of working with this artist. As Tynisha aims to provide brides with the look they have always pictured, you can be certain that you will love the final results and that the look will last throughout dancing the night away. Anh has loved makeup since she was a little girl and throughout her life has worked to learn all of the skills to ensure she is great at what she does. 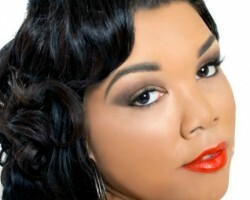 It can be easily seen in her before and after photos that she is one of the most talented Atlanta makeup artists. When you want to look your absolute best on your wedding day then you shouldn’t put your look in any other makeup artist’s hands and should only trust this professional. Trying to find the highest quality of bridal makeup and hair in Georgia whilst also having access to affordable prices can seem like an impossible task but this is not the case when you come to this salon. Trio Makeup and Hair Design is a group of experts that are able to provide every beauty service that you could possibly need. They work together to create your look that will take everyone’s breath away and turn every head on the biggest day of your life. On your wedding day you wouldn’t want the makeup artist to make you look like a different person. Serena Jenkins is one of the leading experts in Atlanta at enhancing the natural beauty of her clients and using the latest techniques to create the look the bride has always dreamed of having on their special day. She will be able to take care of your wedding hair and makeup while you sit back, relax and enjoy getting ready for your wedding. Many brides complain that their makeup looked great at first but didn’t last throughout their celebration. This is where Artistry by Megha comes in, she has developed her techniques so it almost feels like her look was applied using permanent makeup. This means that you will not have to worry at all about your wedding look because when Megha applies it you will look stunning and will continue to do so long into the night. Not only are the results amazing but working with Megha is an all-round enjoyable experience.